There are three blade op­tions, which de­ter­mine the shape left on a lead after cut­ting. This cut leaves a pyra­mi­dal tip at the end of the wire. It is par­tic­u­larly suit­able for stan­dard jobs where the final shape does not play a sig­nif­i­cant role. Cut­ters with this cut are suit­able for both soft cop­per wires and very hard wires such as stain­less steel. This cut leaves a much smaller tip at the end of the wire than the semi-flush cut – with­out re­duc­ing the cut­ting ca­pac­ity. The cut­ting edges are finer than on semi-flush cut­ters. The ef­fort ex­erted when cut­ting is less and the load on the com­po­nent is re­duced. Flush wire ends re­duce the ef­fort needed to fit com­po­nents on printed cir­cuit boards. Erem guar­an­tees pre­cise cut­ting even after fre­quent use. Only Erem of­fers you a super full flush cut. This cut pro­vides ab­solutely flush wire ends. No re­work is needed. Cut­ters with this cut are ab­solutely pre­ci­sion-ground and sharp­ened. The ef­fort ex­erted when cut­ting is low, as is the load on the com­po­nent caused by the cut. Sol­der­ing tags in sol­der­ing-bath pro­ce­dures are pre­vented. Cut­ters of this type are used in mi­cro­elec­tron­ics, space travel or med­ical tech­nol­ogy. 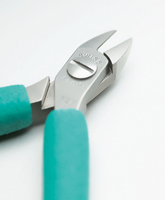 These cut­ters are suit­able for soft wires.